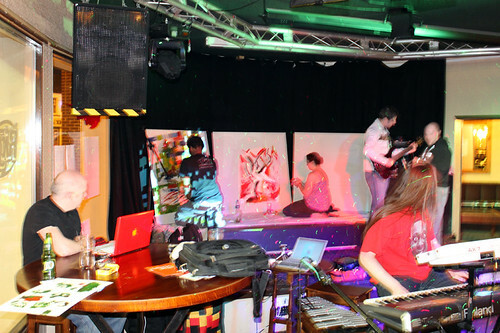 On Thursday 4th March I took part in the AntsArtJam at BitJam in Stoke-on-Trent. 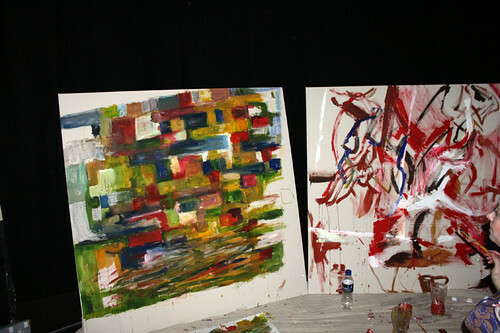 Three canvases were set up on the stage and artists were invited to get creative on them as the night went on. Those who know me will know that live art is not something that I’ve really done before. I’ve done a fair bit of performing, but nothing like this, so it was quite an exciting challenge. 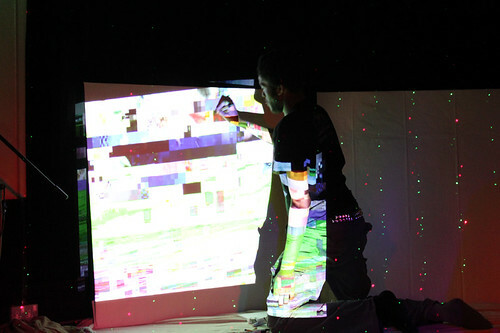 In my performance I set out to explore how to preserve glitches. Although there are no rules or even strict definitions to terms such as databending or glitch art, to me glitches are naturally occurring errors whereas databending is the act of reproducing an error. Take, for example, my Glitches set and my Databending set on Flickr. Whereas the Databending set is quite full the Glitches set has only three items. I feel this is because it’s harder to capture naturally occurring glitches as you’re often not prepared for them. To prepare for my performance I downloaded the two movies from the Blender Foundation (Big Buck Bunny and Elephants Dream) and used a modified version of MPEGFucker to databend them. I opened them to at least see if they could be played, but otherwise had no idea what state they were in. 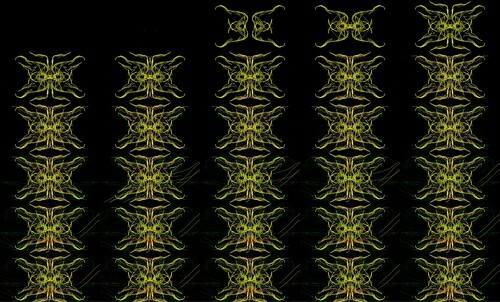 This was then projected onto the canvas where I began to paint it. I got a few questions asking how I was actually determining what to paint. Afterall, images were zooming by at 24 frames per second, so how would I decide what colour to put where? Overall I was looking for patterns. From the five or so seconds of footage that I’d see I’d try and determine what average value best represented it. In some ways this is a randomised process. I had only seen seconds of the glitched movie prior to the performance so didn’t know what to expect. Also, marks that I made on the canvas were determined by where my brush was, what colour was on there at the time and what was being projected. To add to this throughout the three-hour performance I didn’t really get to see any of what I was painting, due to the projection onto the canvas. I’m sure there were many occasions where I painted over the same spot many many times. And a nice little animation of those done using GIMP and Openshot. 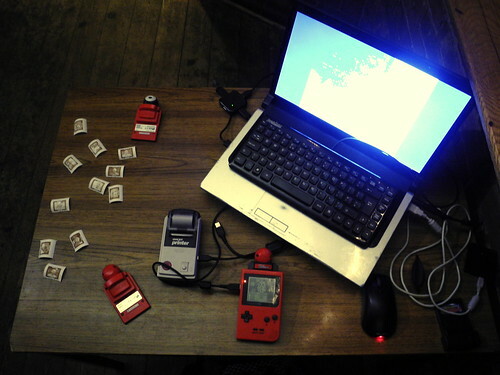 The next method was to use the Echobender script on a webcam pointing at the stage. Obvious errors in the sound recording actually kinda complimented the video. However, I’m a lil bit disappointed by the speed of the script at the moment. I may investigate doing something similar in Processing.